This is part 22 of Categories for Programmers. Previously: Monads and Effects. See the Table of Contents. If you mention monads to a programmer, you’ll probably end up talking about effects. To a mathematician, monads are about algebras. We’ll talk about algebras later — they play an important role in programming — but first I’d like to give you a little intuition about their relation to monads. For now, it’s a bit of a hand-waving argument, but bear with me. This expression is formed using variables like x, and constants like 1 or 2, bound together with operators like plus or times. 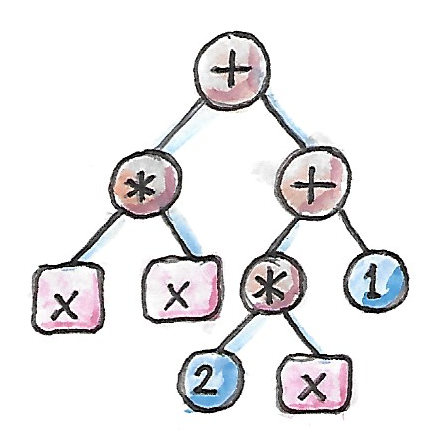 As programmers, we often think of expressions as trees. Yes, that’s the signature of monadic bind. That was a bit of motivation. Now let’s get to the math of the monad. Mathematicians use different notation than programmers. They prefer to use the letter T for the endofunctor, and Greek letters: μ for join and η for return. Both join and return are polymorphic functions, so we can guess that they correspond to natural transformations. 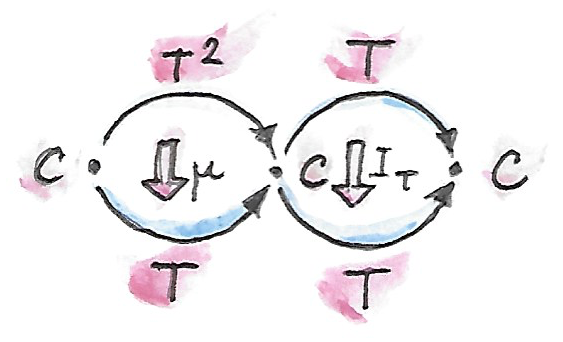 Therefore, in category theory, a monad is defined as an endofunctor T equipped with a pair of natural transformations μ and η.
μ is a natural transformation from the square of the functor T2 back to T. The square is simply the functor composed with itself, T ∘ T (we can only do this kind of squaring for endofunctors). which, in Hask, translates directly to our definition of join. which translates directly to our definition of return. In terms of the algebraic interpretation, we are just composing two successive substitutions. For Kleisli arrows to form a category we want their composition to be associative, and ηa to be the identity Kleisli arrow at a. This requirement can be translated to monadic laws for μ and η. But there is another way of deriving these laws that makes them look more like monoid laws. In fact μ is often called multiplication, and η unit. Roughly speaking, the associativity law states that the two ways of reducing the cube of T, T3, down to T must give the same result. 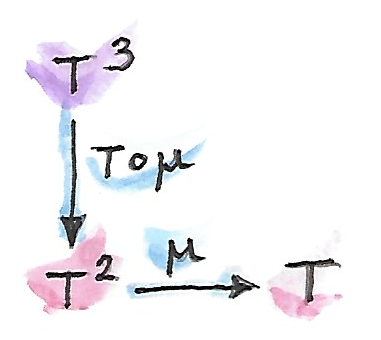 Two unit laws (left and right) state that when η is applied to T and then reduced by μ, we get back T.
and get T∘T; which can be further reduced to T by applying μ. IT is the identity natural transformation from T to T. You will often see the notation for this type of horizontal composition IT ∘ μ shortened to T∘μ. This notation is unambiguous because it makes no sense to compose a functor with a natural transformation, therefore T must mean IT in this context. 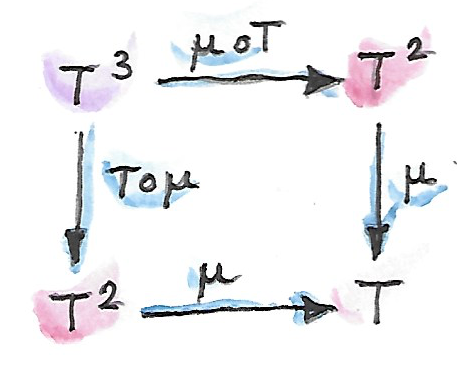 Alternatively, we can treat T3 as the composition of T2∘T and apply μ∘T to it. The result is also T∘T which, again, can be reduced to T using μ. We require that the two paths produce the same result. Similarly, we can apply the horizontal composition η∘T to the composition of the identity functor I after T to obtain T2, which can then be reduced using μ. The result should be the same as if we applied the identity natural transformation directly to T. And, by analogy, the same should be true for T∘η. You can convince yourself that these laws guarantee that the composition of Kleisli arrows indeed satisfies the laws of a category. The similarities between a monad and a monoid are striking. We have multiplication μ, unit η, associativity, and unit laws. But our definition of a monoid is too narrow to describe a monad as a monoid. So let’s generalize the notion of a monoid. The binary operation mappend must be associative and unital (i.e., multiplication by the unit mempty is a no-op). Here, the cartesian product (m, m) becomes the source of pairs to be multiplied. This lets us pick the unit “element” without having to talk about elements. Unlike in our previous definition of a monoid as a single-object category, monoidal laws here are not automatically satisfied — we have to impose them. But in order to formulate them we have to establish the monoidal structure of the underlying categorical product itself. Let’s recall how monoidal structure works in Haskell first. We have formulated point-free monoidal laws for mu and eta using the fact that the underlying cartesian product itself acts like a monoidal multiplication in the category of types. Keep in mind though that the associativity and unit laws for the cartesian product are valid only up to isomorphism. It turns out that these laws can be generalized to any category with products and a terminal object. Categorical products are indeed associative up to isomorphism and the terminal object is the unit, also up to isomorphism. The associator and the two unitors are natural isomorphisms. The laws can be represented by commuting diagrams. Notice that, because the product is a bifunctor, it can lift a pair of morphisms — in Haskell this was done using bimap. We could stop here and say that we can define a monoid on top of any category with categorical products and a terminal object. 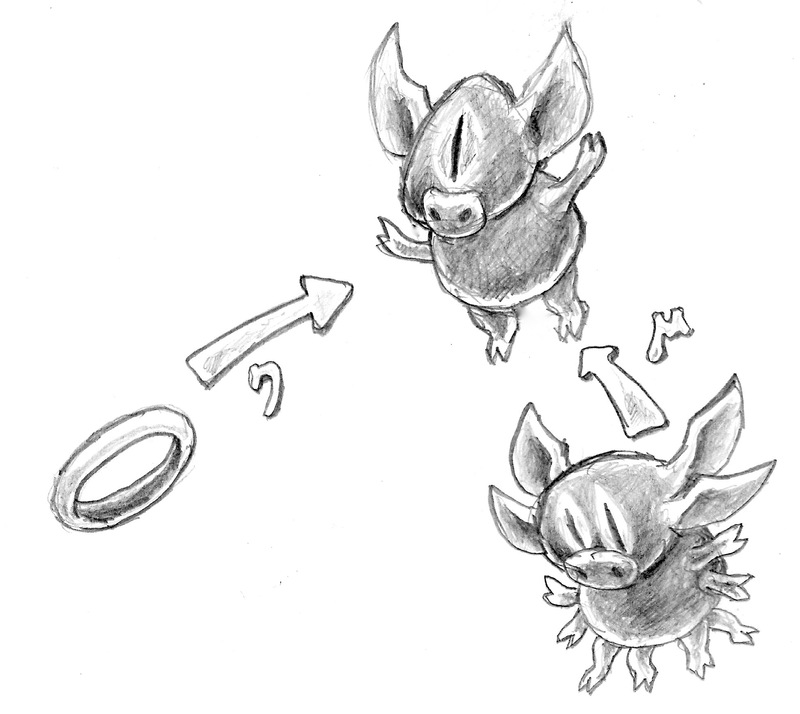 As long as we can pick an object m and two morphisms μ and η that satisfy monoidal laws, we have a monoid. But we can do better than that. We don’t need a full-blown categorical product to formulate the laws for μ and η. Recall that a product is defined through a universal construction that uses projections. We haven’t used any projections in our formulation of monoidal laws. A bifunctor that behaves like a product without being a product is called a tensor product, often denoted by the infix operator ⊗. A definition of a tensor product in general is a bit tricky, but we won’t worry about it. We’ll just list its properties — the most important being associativity up to isomorphism. What’s important is that a tensor product describes many familiar bifunctors. In particular, it works for a product, a coproduct and, as we’ll see shortly, for the composition of endofunctors (and also for some more esoteric products like Day convolution). Monoidal categories will play an essential role in the formulation of enriched categories. where i is the unit object for our tensor product. Notice that it’s essential that the tensor product be a bifunctor because we need to lift pairs of morphisms to form products such as μ ⊗ id or η ⊗ id. These diagrams are just a straightforward generalization of our previous results for categorical products. Monoidal structures pop up in unexpected places. One such place is the functor category. If you squint a little, you might be able to see functor composition as a form of multiplication. The problem is that not any two functors can be composed — the target category of one has to be the source category of the other. That’s just the usual rule of composition of morphisms — and, as we know, functors are indeed morphisms in the category Cat. But just like endomorphisms (morphisms that loop back to the same object) are always composable, so are endofunctors. For any given category C, endofunctors from C to C form the functor category [C, C]. Its objects are endofunctors, and morphisms are natural transformations between them. We can take any two objects from this category, say endofunctors F and G, and produce a third object F ∘ G — an endofunctor that’s their composition. which you may recognize as the special case of horizontal composition. We also have at our disposal the identity endofunctor I, which can serve as the identity for endofunctor composition — our new tensor product. Moreover, functor composition is associative. In fact associativity and unit laws are strict — there’s no need for the associator or the two unitors. So endofunctors form a strict monoidal category with functor composition as tensor product. All told, monad is just a monoid in the category of endofunctors. You might have seen it emblazoned on some t-shirts at functional programming conferences. Monadic laws follow from the identities satisfied by the unit and counit of the adjunction and the interchange law. (uncurried, because in counit it acts on a pair). In other words, we need to sneak the counit ε across one level of the reader functor. We can’t just call fmap directly, because the compiler would pick the one for the State functor, rather than the Reader functor. But recall that fmap for the reader functor is just left function composition. So we’ll use function composition directly. This is indeed the implementation of join for the State monad. It turns out that not only every adjunction gives rise to a monad, but the converse is also true: every monad can be factorized into a composition of two adjoint functors. Such factorization is not unique though. We’ll talk about the other endofunctor L ∘ R in the next section. I assume by “Hask” you mean the category of cppo’s and continuous functions? If so, this has nothing much to do with Haskell, because it is not fully abstract with respect to the operational meaning of Haskell programs. It should be called CPPO, like everyone else does, and not the pretentious “Hask”, which serves only to mislead. In fact, Haskell has no semantics, which is pretty embarrassing for a supposedly mathematical language. The mapping a -> m b deserves a picture! I can see in my mind’s eye that you’ve taken the 3 node expression tree +(y (-1)) and spliced it over each of the three occurrences of x to obtain the new tree of type m b. All that’s missing is a color y to represent what happens to the pretty pink of x, and you’ve reached in and drawn the result of this monadic bind! In the commuting diagram about unit laws in section “Monoid in a Monoidal Category”, the rightmost object should be the tensor product between m and i (not between m and id as it is shown). @Juan Manuel: You’re right. I can’t even call it a “typo” since it’s hand-written. I’ll fix it at some point. Thank you for writing this series! It is by far the most intuitive and programmer friendly into to category theory out there. I only wish I found it earlier. I very much hope you find energy and time to continue writing. I have a question about the definition of mu/join natural transformation for R.L adjunction (mu = R . epsilon . L). with epsilon viewed as a family of morphism and R fmaps them to act on D. This approach is actually what you have ended up using in your State monad example. Interestingly, this approach does not use L. Is this somehow equivalent to the horizontal composition R . epsilon . L you are using in your definition? The L on the right is necessary to “shift” epsilon — to pick the right morphism from the family of morphisms. This is invisible in Haskell code because of type inference. The compiler figures out what component to pick by analyzing types. I tried to explain horizontal composition in more detail in this video: https://www.youtube.com/watch?v=zkDVCQiveEo . given that mu is defined as mu :: (m, m) -> m? This definition seems, at least, to be the one used going forward when using bimap to arrive at a point-free definition. You’re right. I’m so used to currying, I overdid it. But I still have a small question, I can understand the version of monad laws based on Kleisli composition, I can also understand the version described as natural transformation, but I still find difficulty showing the equivalence relationship between them in rigorous math languages. Could you please elaborates slightly more on how “You can convince yourself that these laws guarantee that the composition of Kleisli arrows indeed satisfies the laws of a category”? Thanks! The standard method of proof is to rewrite all natural transformations in terms of components (which are morphisms), keeping track of the objects.